Finely chop the herbs and combine with the lemon zest (this is the gremolata). Meanwhile, in a large skillet, heat the EVOO (4 turns of the pan) over medium heat. Add the pancetta or guanciale, season with pepper, and cook until browned, 2 to 3 minutes. Stir in the garlic, reduce the heat a bit, and stir another 2 to 3 minutes. Add the wine. Salt the boiling water and cook the pasta to al dente. Ladle out 1 cup of the starchy pasta cooking water and beat into the egg yolks to warm them. Drain the pasta and toss with the garlic and pancetta and the warm egg yolks. Sprinkle in half the cheese and continue tossing 1 minute more. 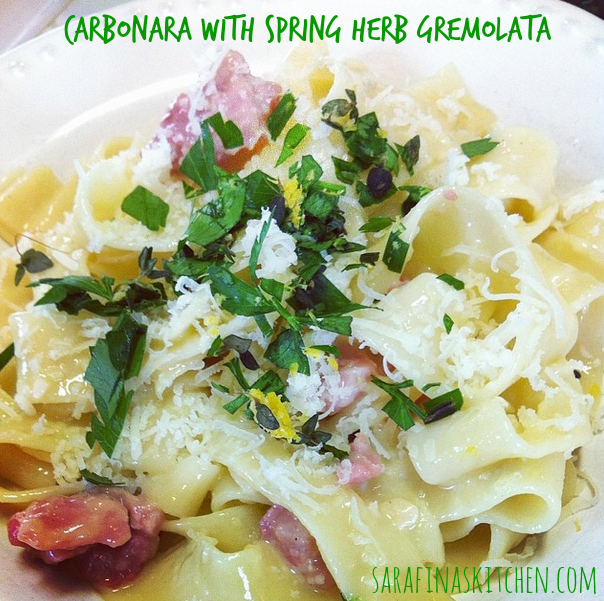 Serve in shallow bowls with the remaining cheese and the herb gremolata sprinkled over the top. My notes: I tempered the egg yolks as I added them to the pasta water. I was afraid they’d end up cooking. Either that, or you can let the pasta water cool enough so that they don’t. This looks like a delightful spring dish. It was very good. The herbs brightened it so that it wasn’t too heavy.